The NRHA Professionals is a program of the NRHA. To become a member, professional trainers are required to sign the following statement. Conduct all business affairs with integrity, sincerity, and accuracy in an open and forthright manner. Act with integrity in dealings with clients, other professionals, and the public. In this regard, any horse shown by my spouse, client, or child will be economically owned as prescribed by applicable NRHA rules. Handle our business operations in a manner in which promotes the image of the Reining horse industry. 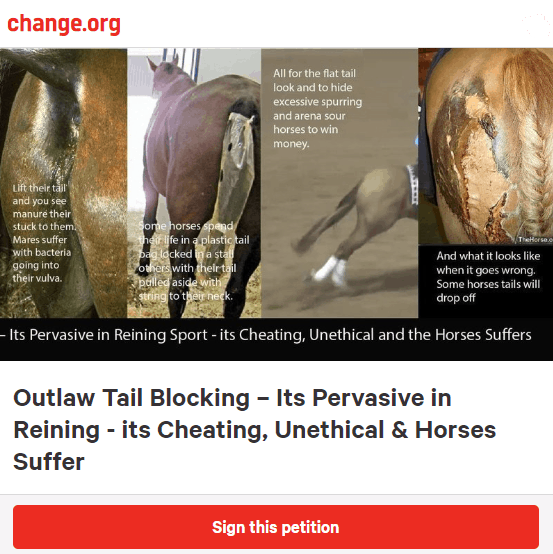 Instill confidence among clients and the public in the Reining horse industry, avoiding any action conducive to discrediting it or membership in the NRHA. In 2013 and following years, the NRHA program known as Professional Reining Trainers, membership form included their Code of Ethics. Who is governing their members to fulfill their obligations? Who is setting the checks and balances for animal welfare within the NRHA? How are they governinging to fulfill their obligations under the Code of Ethics? What is the impact on the public that read this document in their decision-making to use NRHA Professional trainers?